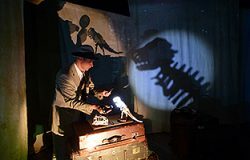 CLYDEBUILT Puppet Theatre, a long-established Scottish company, brings a new show, Dinosaur Detectives, for an Artsreach tour at Toller Porcorum on Wednesday 24th at 4pm, Morden on Thursday 25th at 2pm and Nether Compton on Friday 26th at 11am. As the dinosaurs hunt for clues about the past, they discover a secret doorway and a number of cases that contain the stories of the people who discovered dinosaur bones in Victorian times. Join them on a fascinating journey to learn about the first fossil finds of Mary Anning, William Buckland and Gideon Mantell – discoveries which changed our understanding of pre-history. Established in 1987, Clydebuilt is one of Scotland¹s leading touring puppet companies, touring extensively throughout the UK and annually performing over 200 shows, also performing in China, Germany and the Middle East. Dinosaur Detectives is on Wednesday 24th October at 4pm atToller Porcorum village hall, 01300 320373. Thursday 25th at 2pm, Morden village hall, 01929 459431and Friday 26th at 11am at Nether Compton village hall, 01935 413220. There is a post-show fossil table featuring fossils including real bones and dinosaur poo!